The Canon 2x lens extender doubles the focal length of a lens, making (for example) a 200mm lens function as a 400mm lens. The 2x series was introduced in 1987, and updated in 2001 with the version II model, the subject of this review. 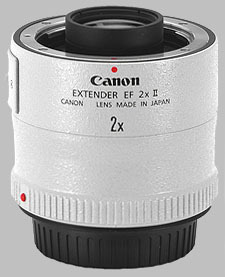 Canon lens extenders were designed in the era of film, making them fully compatible with full-frame, APS-H and APS-C EOS digital cameras. The trade-off to the doubly extended range is the loss of two stops of light-gathering ability of the lens: accordingly, an ƒ/2.8 lens will operate as a ƒ/5.6 lens. The 2x II Extender, while technically superceded by the newer version III Extender, is still available now, for around $320. We'd like to thank LensRentals.com for their loan of this extender for our testing: to rent this lens, click here. We used Canon's 200mm ƒ/2.8L II USM telephoto lens to test the 2x II Extender, comparing the sharpness of the lens with and without the extender attached. Without the extender, the lens shows very good results at ƒ/2.8, becoming almost tack-sharp at ƒ/4 through to ƒ/11. 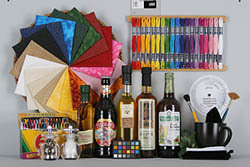 With the Extender attached, sharpness is noticeably reduced. You'll never get tack-sharp results with the 2x II Extender attached: at f/5.6, the lens produced images of only moderate sharpness, with some improvement stopped down. Images at f/8, f/11 and f/16 show essentially the same level of sharpness, good but not great, and then things soften up again as the lens is stopped down to f/32 or smaller. At f/45 and especially f/64, things get pretty fuzzy. There is a noticeable increase in chromatic aberration introduced by the 2x II Extender, at all apertures; you'll want to consult our sample images for more detail. Using the 2x II Extender alleviates corner shading noticed without the use of the extender, at the ƒ/2.8 setting, but that's only because the ƒ/2.8 aperture is no longer available. At the widest setting of ƒ/5.6, the corners are only a 1/4 stop darker than the center. The 200mm ƒ/2.8L offers light barrel distortion in the corners and overall, very light pincushion distortion: adding the 2x II Extender actually alleviates any problems of distortion, producing almost no distortion throughout the image. In our usage of the 2x II Extender, we noticed a significant impact on the autofocus performance of the 200mm ƒ/2.8L II USM lens, which is fast and snappy all on its own. However, Canon warns that there is an impact on autofocus performance with type II and III Extenders. Specifically, Canon suggests that AF drive speed is reduced by 75% when using the 2x Extender. The 2x Extender has some useful implications in macro work, offering an extra 100% magnification without sacrificing the minimum close-focusing distance; in the case of the 200mm ƒ/2.8L II USM, this results in 0.32x magnification instead of 0.16x magnification. The Canon 2x II Extender is heavy for its size, at just over 9 ounces, suggesting a fair amount of metal in its construction. The finish of the lens is white, to match Canon's upper-tier L-class telephoto lenses, for which the lens is designed to be paired. 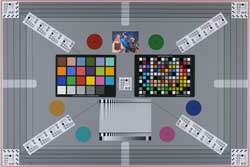 The design of the lens is quite simple, 7 lens elements in 5 groups, and there is only one control surface on the extender: a switch to release an attached lens. The extender can be combined with the 1.4x Extender for a significant increase in focal length, but at the cost of significant reduction in light-gathering ability: you would lose three stops of light for an additional 240% in focal length, making your 200mm ƒ/2.8 lens the equivalent of a 480mm ƒ/8 lens. The Type III version of the lens Extender doesn't do much to enhance image quality: there is a slight improvement in resistance to chromatic aberration, but image sharpness is more or less the same. However, the big improvements are enhancements to autofocus speed and accuracy, as well as the addition of weather-resistant seals. We reviewed the Canon 400mm ƒ/5.6L USM back in 2008, which makes a good candidate for comparison with the 200mm ƒ/2.8L USM and 2x Extender attached. In terms of sharpness, the two are quite similar: the 400mm is slightly better at ƒ/5.6 and ƒ/16, but at ƒ/8 and ƒ/11, they're almost identical. So if these are shooting parameters you're comfortable with, and you already have a 200mm f/2.8L, you can probably get the Extender instead of the 400mm lens. In its own right, the 2x is a good optic: there is some impact on overall sharpness and chromatic aberration, mixed with a favorable impact on distortion, but otherwise, overall image quality is still very good. Works well with 400 F2.8 IS though I had to try out 3 different examples of the convertor to get one to work well with my lens. Well worth the effort though since I now have a 800mm f5.6 IS lens which gives great results. Forget using this 2x convertor with an 'L' zoom though the results are abysmal, this convertor really demands a top lens for it to work properly - NO zoom can meet this requirement. Obvious impact on image quality on multi-element lenses like the 70-200 2.8 is, but probably not as big an issue with the super teles. Still it does give you much more reach at a modest cost, so you will probably have a love-hate relationship with it!